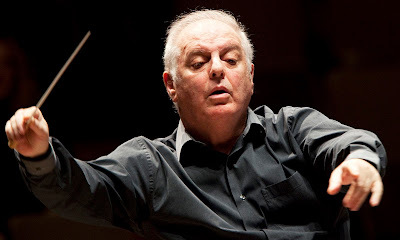 I ran across some amazing videos on You-Tube of a series of masterclasses on the Beethoven piano sonatas given by virtuoso pianist and conductor, Maestro Daniel Barenboim. From Maestro Barenboim's web site: The 75 year old Daniel Barenboim was "born  in Buenos Aires, Argentina, to Jewish Russia immigrant parents." To watch and listen to this brilliant dialogue and instruction of the Beethoven sonatas between great virtuoso pianists is mesmerizing to me. It's like listening to one genius interact with another, in my eyes. To show you what I mean, here is the Daniel Barenboim masterclass with virtuoso pianist, Lang Lang, on the Beethoven Piano Sonata #23 in F-minor known as "Appasionata" [with passion, deeply emotional]. It takes 4 videos to show the entire masterclass The first video is more of an introduction of the series, and videos 2-4 are the instruction by Barenboim. I promise you, after you watch video 2, you will be mesmerized like me and must watch #'s 3 and 4, to see how it ends. So, please turn up the volume and play in full screen the Daniel Barenboim Masterclasses on the Beethoven "Appasionata" piano sonata [1st movement] with Lang Lang; and then watch on another video Maestro Barenboim's performance of the complete Appasionata Sonata that has 3 movements: 1. Allegro Assai; 2. Andante con moto; and 3. Allegro ma non troppo - presto.